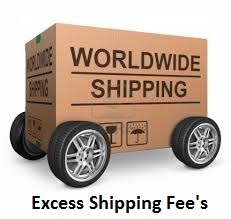 Depending where you are in the world or the amount of goods you purchase, you may occasionally have to pay some excess postage, from that which is indicated on the item. For instance, if you buy two pairs of rims it will be more expensive to post but will not be double. We may ask you to make an extra payment and this price matrix allows you to make up any outstanding amount. If it was, say 9 gbp, then you can purchase 3 of the 3 gbp payments. If you are unsure please contact us first.